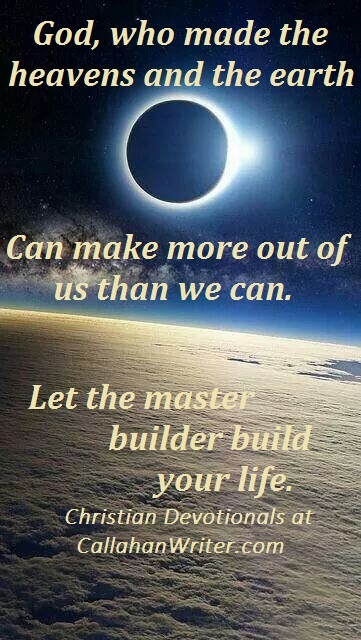 Let God Build Your Life – A Christian Devotional | Troy C. Wagstaff aka CallahanWriter Blog: Topics of interest include Western Historical (1865-1899) Topics. Additionally inspirational Christian and Fibromyalgia interests. God, who made the heavens and the earth can make more out of us than we can. God knows the hairs on your head. A sparrow does not fall without him knowing about it. Even with all the wisdom and learning we have, we can be so much more if we let God into our lives and let him build our life. We just need to seek understanding of his will and follow his teachings and we will become far more than we ever thought possible.